The California law suit against Bristol-Myers Squibb and the blood thinner Plavix involved almost 700 plaintiffs because the drug “allegedly created a substantial risk of heart attack, stroke and other injuries,” wrote Jess Bravin in The Wall Street Journal. But only 86 plaintiffs were from California and according to a new Supreme Court 8-1 ruling, only those cases can be heard in that state. 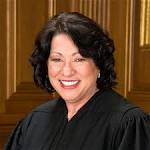 Justice Sonia Sotomayor dissented. “The ruling was one of a series this term limiting so-called forum shopping, where plaintiffs’ attorneys file suit in a state or federal court they believe will be sympathetic to their claims,” Bravin reported. Had you heard of forum-shopping before? Do you agree with the Supreme Court—that the court in a state can hear only about plaintiffs from that state? Or does that help corporations “avoid responsibility for harm they cause,” that consumer groups fear? This entry was posted on Monday, June 26th, 2017 at 10:24 am	and is filed under Justice, Laws, Medicine	. You can follow any responses to this entry through the RSS 2.0 feed. You can leave a response, or trackback from your own site. Well. That’s why we have the Supreme Court. That’s a really, really tough question. I wouldn’t know where to begin. Also with this wedding cake/bakery/gay pride wedding/I wouldn’t know who to favor for first right amendments that the couple has the right to have a cake made by a public bakery, but perhaps the bakery has the right to not cooperate with a couple that goes against their inner feelings? Tough, tough, tough. I like your blog when I am able to have some sort of answer… Now you’re just getting too tough! These decisions are at times heart-wrenching [though most of my posts aren’t this challenging! ]I imagine that after studying a case there must be times that the Supreme Court Justices don’t sleep well at night especially in almost flips-of-a-coin instances where interpreting the law is concerned. Given that this was an 8 to 1 decision, there might not have been that much tossing and turning. I also bet that there isn’t any negotiating going on as in “you vote my way on this case and I will go your way on that one.” Off the bat I can’t think of many instances in life quite like this. If I read this correctly, then the aggrieved from each and every state can sue a given corporation for damages. This could prove very costly to a business — they could be hit with more than 50 complaints, if we count Puerto Rico and the Philippines. Let’s see how much they like that. A little less than 250 years ago,considerably less than a million European, mostly British, white men, with diverse religious and political beliefs, under thirteen distinct colonial governments, decided that they, not a colonial master 3,000 miles away, should manage their own affairs. Between good luck, a false try or two – one resulting in the bloodiest war ever before in world history –, and occasionally, at the right times, extraordinary leadership, our present government by rule of law evolved. This system may not always seem fair, but it works better than most. I’m not a lawyer, but it seems to me that the jurisdictional issue is the right one upon which to make this decision, which is what this court did. If you want to cure ”forum-shopping,” the way to do it is to amend the constitution. But, I’m not sure you want to do that ether. Conservatives “forum-shop” too. I guess that this is true IF the plaintiffs have enough money to do so. I would imagine with legal fees being what they are that 700 people sharing the cost might make a suit manageable. But if a state had only 10 or 12 plaintiffs, the legal work–and cost–would be the same and if the courts are pro-business, the expenditure falling on the shoulders of a few, would be a waste. Further, these huge corporations have deep pockets when it comes to their legal budgets. Someone who is ill may have already spent all their money on insurance and co-pay medicine and doctor’s/nursing care. And the impact won’t be nearly as big state by state as nobody will know that so many are affected. In addition, if 700 people had severe reactions to a drug, that should be enough for the FDA to get the manufacturer to fix the problem/revamp the formula. If they are unaware of the total number in future, they might not. Your historical perspective helps calm my nerves. It diverts my suspicions from thoughts of conspiracy–that the small fry is a gonner when fighting a big corporation and that maybe big pharma has influenced the justices–and reminds me that there is solid precedent for their decision. Although you are not a lawyer, something tells me your knowledge of history and your thoughtful insight might have made you a commendable supreme court justice. Their work is fascinating but at times might feel like a burden and overwhelming responsibility.